Definition and Summary: The Dawes Plan was a plan for the collection of the German reparations following WW1. The Dawes Plan was worked out by an international committee of experts under the chairmanship of the American banker Charles G. Dawes as a war reparations payment plan for Germany. It was proposed by the Dawes Committee on April 9, 1924, and accepted by the Allied and German Governments on August 30, 1924. Calvin Coolidge was the 30th American President who served in office from August 2, 1923 to March 4, 1929. One of the important events during his presidency was the Dawes Plan. The following fact sheet contains interesting facts and information on the Dawes Plan for kids. Dawes Plan Fact 1: Following WW1 (28 July, 1914 - 11 November, 1918), the 1919 Treaty of Versailles addressed War-Guilt provisions and demanded massive amounts of money, called Reparations, from Germany as compensation for the Great War. Dawes Plan Fact 2: Germany and the Weimar Republic was on the brink of financial collapse and was in danger of not being able to pay its wartime reparations. German reparations had been set at nearly 20 billion marks and was finding it difficult to meet its obligations. The aim of the Dawes Committee was to find a solution to the problem. Dawes Plan Fact 3: The Dawes Plan was a reparations payment plan for Germany worked out by an international committee of experts under the chairmanship of the American banker Charles G. Dawes. Dawes Plan Fact 4: The committee convened during 1923-1924 and consisted of 10 representatives, two each from the United States, Belgium, France and Great Britain who worked on the pact. Dawes Plan Fact 5: America was experiencing the Economic Boom of the 1920's. Before WW1 America had been in debt to Europe. After WW1 the situation was reversed and the former Allies owed the US more than $10 billion for the cost of food supplies and armaments. 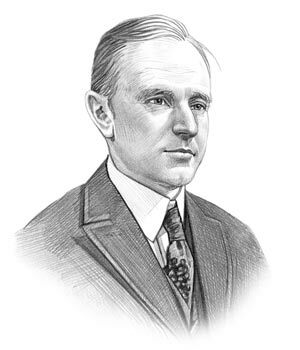 Dawes Plan Fact 6: The Dawes Plan was presented by Charles Dawes, who was also the US budget director, and proposed by the Committee on April 9, 1924. The plan was to gave Germany longer to pay its heavy war reparations and the pact agreed to an American loans to Germany of 800 million gold marks. Dawes Plan Fact 7: The Great Britain and France also agreed to accept less in reparations and pay more on their war debts to the United States. Dawes Plan Fact 8: The Plan was accepted by the Allied and German Governments on August 30, 1924. Dawes Plan Fact 10: Germany ended up not only paying their war reparations but also found themselves in debt to American banks. Dawes Plan Fact 11: The provisions of the Dawes Plan was only viable as a short term solution as Germany could not continue the huge annual payments especially over an indefinite period of time..
Dawes Plan Fact 12: The 1929 Young Plan was therefore substituted to reduce the total amount of reparations due from Germany and extended the payment period until 1988. However due to the 1929 Wall Street Crash the Young Plan only remained in effect until July 1931 and was officially abolished in 1932. The article on the Dawes Plan provides detailed facts and a summary of one of the important events during his presidential term in office. The following Calvin Coolidge video will give you additional important facts and dates about the political events experienced by the 30th American President whose presidency spanned from August 2, 1923 to March 4, 1929.